Dickens was dead, and Drood was unfinished, with audiences clambering to know the ending while the publishers Chapman and Hall were denying the reader’s quest for closure. Their frank (and ultimately incorrect) statement at the end of the sixth number that ‘Beyond the clues therein afforded to its conduct or catastrophe, nothing whatever remains’ left the door wide open to enterprising authors to cash in on the demand for an ending. Orpheus C. Kerr had unwittingly found himself in the position of solutionist and had swiftly got himself to the end in typically comic fashion; it was Henry Morford who next took up the gauntlet, as soon as 1871, and provided the first intentional attempt at finishing Dickens’s tale. What is truly remarkable about John Jasper’s Secret is not its plot so much as its style, and even more so, its marketing. The work was published anonymously, and in the absence of a given author, rumour soon arose as to who might have stepped forward to finish the master’s last story; and the search did not extend far beyond Dickens; the work was soon generally held to be a collaborative work between none other than Wilkie Collins and Charles Dickens Jnr. The rumour was squashed by Collins but to no avail; later editions of the text would print Collins and Dickens’s name on the cover, and even now that beacon of truth, Wikipedia, tells us on the page for Charles Dickens Jnr’s biography that among his published works is one John Jasper’s Secret (as it happens, Charley did in fact write a sequel to Drood, a play, which was never performed but the manuscript of which survives in the Dickens House Museum – more on that in coming months…). 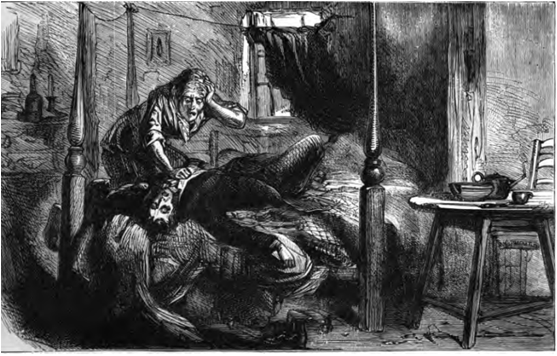 As these picture show, the illustrations for Morford’s tale tried to emulate the original drawings by Luke Fildes (and the book itself was published in monthly numbers to further emulate the first half), but in the second picture we can see a dash of the macabre and shock added to Fildes’s realistic drawings, a look back to the caricatures of Phiz that would remain synonymous with Dickens’s characters, as well as a nod towards the more sensational aspects of Morford’s plot. The resulting tale (and you’ll note how I’m not giving the end away) is a curious mix of the familiar and unfamiliar, striking the right notes but not always in the right places, or with true conviction to convince us that this is indeed the ultimate ending. 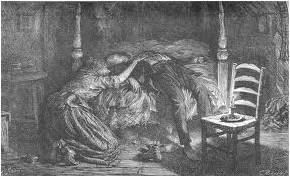 Morford makes no attempt to reconstruct Dickens’s intention, preferring instead to pursue his own choice of plot, so that the end-result is not a solution so much as an exploration, an indulgence, a nostalgic walk back through the works of Dickens that looks ahead in turn to the works of his protégé. This entry was posted in The Drood Inquiry - Early Solutions and tagged Charles Dickens, John Jasper's Secret, Nineteenth Century, The Mystery of Edwin Drood, Wilkie Collins. Bookmark the permalink. I found the 1898 edition of “John Jasper’s Secret”, published by R. F. Fenno & Company, 9 and 11 East Sixteenth Street: New York City, many years ago. Wilke Collins’ name is on the spine, and both names on the title page. There is a “Preface” (unsigned, undated) but no frontispiece or plates. As I recall, it was quite readable, but it’s been quite a while since I read it! You have inspired me to locate and purchase Proctor’s “Watched by the Dead” and the 1914 Walter E Crisp completion. Yes the Collins attribution lasted for some time – interestingly in the early 20th century there was a counter-conspiracy theory whereby some argued that Morford himself was a pseudonym and it really was the work of Collins and Dickens Jnr after all (the theory did not gather much support, I hasten to add).